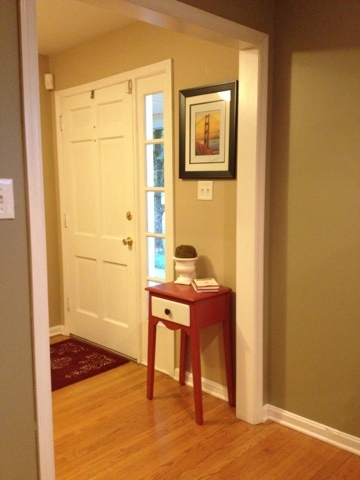 The entryway in our 50+ house is not exactly screaming for a table or bench..it's small and there's no real place to put anything. A table in the hall would take up most of the walkway and with two little ones chasing each other 12 hours of the day I don't really want to risk it. 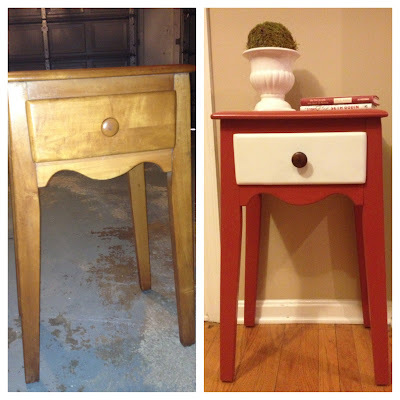 I recently got a small wood nightstand from my late grandparent's estate and fully intended to paint it and use it in my daughter's bedroom. But when it came to painting it I made a rash decision and changed my plans. 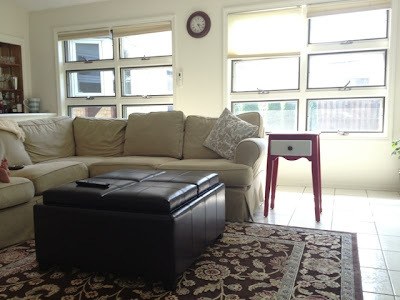 I decided I was going to put it in our sunroom instead. 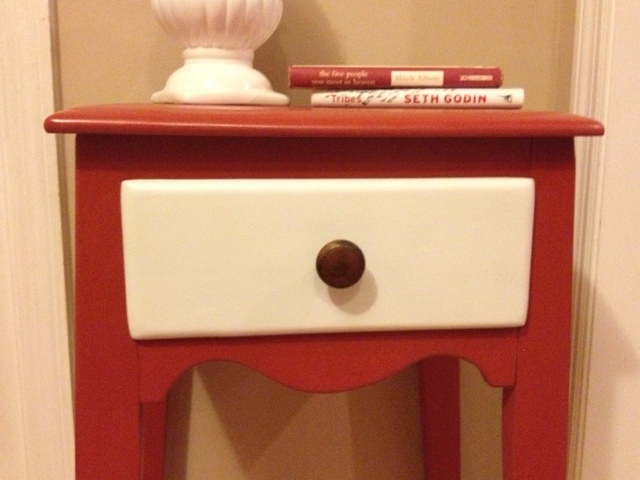 So I made up some DIY chalk paint with leftover red latex paint from the dining room and went to work. This stuff is amazing! 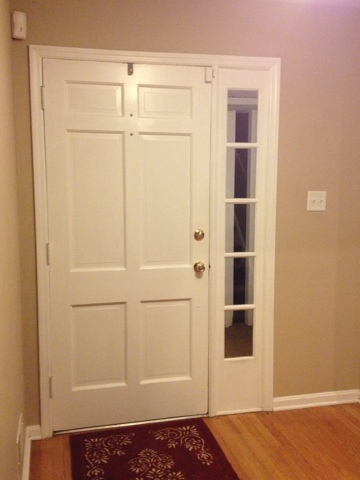 It covers really well and you don't need to do any prep - no sanding or priming! Click here to read find the 3-ingredient "recipe" for homemade chalk paint. 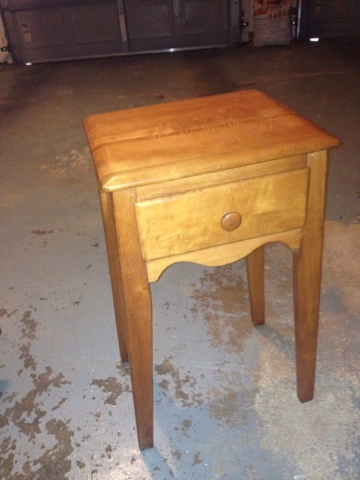 As you can see the drawer was originally painted red. This project was clearly evolving as quickly as I was painting - which was fast because my kids' were only watching a 24 minute show. (Wink, wink.) After the first coat, I thought it was too much red - I really like the look of two-tone like what Steph did here - so I sanded off the red paint from the drawer and I spray painted (yes, I sprayed it) white. I stained the knob a dark walnut that I had on hand. 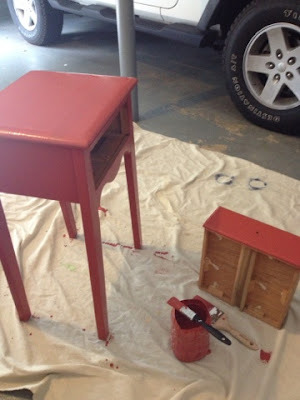 Once the first coat was dry, I added a second coat of red on the table and sprayed the drawer a few more times (several light coats are better than fewer heavy coats when it comes to spray painting). I finished the whole thing off with two coats of polyurethane to seal and protect the paint job. 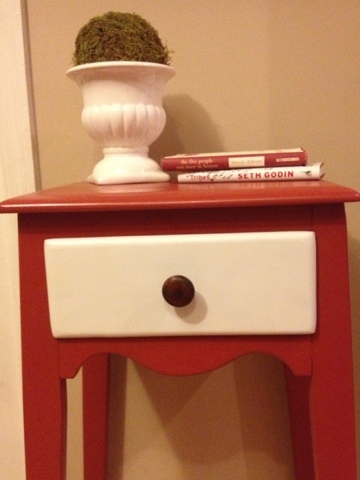 Isn't it amazing a little paint can do this?! Then I moved this badboy into my living room. Um...fail! It was clearly too high to be next to the couch. I left it there to see if it grew on me, but every time I walked into that room it just seemed to stick out like a soar thumb. Next she found a home in my entryway. Better? Better! Right next to my front door I have this odd little empty wall. I thought the table would look perfect there, only it needed something - I didn't know what - above it. I didn't have a mirror on hand and besides with the light switch there, a mirror would be too high. I put a picture there, but I wasn't crazy about it either. 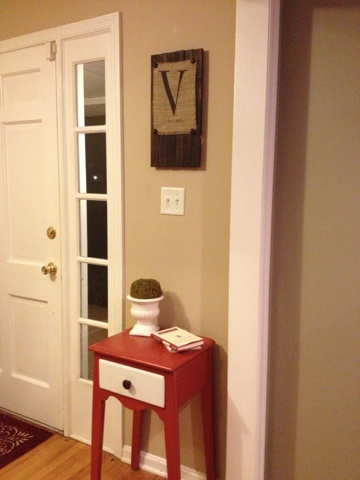 Then it hit me -- I remembered this cute wood and burlap monogram that I had pinned awhile back. I decided it would be perfect right above the table especially if I stained the wood the same color as the knob on the table. Of course, I'd have to make it first. Check back tomorrow for the tutorial on how I made this awesome wood panel and burlap monogram to go right above my painted entryway table! As always, thanks for stopping by 2IY. If you love my new entryway table as much as I do, I'd love for you to pin it!